Dolphins produce sounds differently in air and underwater. Wild dolphins mainly make sounds underwater, although they have been known to emit high-pitched whistles both under the water and above the surface when in distress. The dolphins at Dolphin Research Center, on the other hand, have developed quite a repertoire of sounds produced in the air. These sounds, such as "giggle" (Hear a dolphin "giggle") and "raspberry," (Hear a "razz" sound) were invented by the dolphins and encouraged by the staff. The dolphins often make up new sounds that are mimicked by their pool mates and passed around the facility. Dolphins make sounds in air by releasing air through their blowholes. The dolphins have great muscle control over their blowholes and can alter the sounds by changing the size and shape of the blowhole opening. At DRC, the dolphins apparently vocalize to get people’s attention as they walk by the lagoons. It works very well; there is no way you can walk past a "screaming" dolphin and not reply in some fashion! The sounds that a dolphin makes underwater serve to help them navigate, locate food, glean information about the environment, and to communicate with other dolphins. These sounds are generated inside the dolphin’s head, under the blowhole, and, generally, without air escaping from the dolphin's blowhole. There are two hypotheses about how dolphins produce sound underwater. The most widely accepted hypothesis is the nasal sac theory. Sounds are produced in three pairs of air sacs located underneath the blowhole. 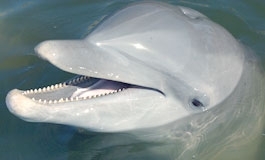 After the dolphin takes a breath, it closes its blowhole, and air returns from the lungs into the channel leading to the blowhole, and, into one or more of the air sacs. The air inflates the sacs. At the opening of each air sac is a nasal plug. Air is forced out of the air sac and over the nasal plug, producing the various sounds. The action of these air sacs is similar to filling up a balloon and then squeezing the end to let out the air. The second hypothesis for sound production is that the air sacs act as an acoustical mirror, focusing sound produced by small knobs of fatty tissue just beneath the blowhole. This tissue may act like lips that flap together when air is pushed past them, creating a pulse that is transmitted out into the water (Au, Popper, & Fay, 2000). 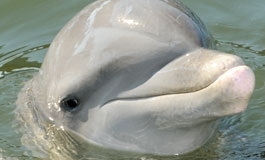 The reason that scientists are not sure which hypothesis is correct is that no one has ever been able to see inside a dolphin’s head while it is making sounds. The medical equipment available today that could allow researchers to see what is happening is too difficult to use with dolphins, and in some cases may present some danger to the dolphin’s well-being. As medical technology progresses, we might one day be able to directly observe the dolphin’s sound producing mechanism. All of the measurements done with live vocalizing dolphins seems to indicate the nasal sac area of the dolphin’s head. The site of sound production appears to be the museau de singe or “monkey lips” which resemble the lips of monkeys. Tests using an endoscopy with a high speed video camera observed the synchronous movements of the monkey lips and the production of pulses (Cranford et al., 1997). These sounds produced by the monkey lips will travel in the forward direction through the melon. The fatty tissue melon located in the forehead area of the dolphin acts like an acoustic lens directing the sound out (Au et al., 2000). The current research seems to indicate that specialized fatty tissues in the jaw region serve as the primary route for picking up sound to the middle and inner ears (Norris, 1968). Dolphins make many types of underwater sounds. The three that are most well-known are their whistles, clicks, and burst pulses. Clicks emitted by dolphins are thought to be exclusively used for echolocation, the dolphin's amazing ability to gather information about its world through sound. (Hear dolphin clicks) Clicks are produced in rapid sequence, called "click trains," that sound to us like a creaking door or loud buzz. The clicks are produced so rapidly, you have to have special equipment to hear just one of them. The frequency range for echolocation clicks is 0.2 to 150 kHz (Reynolds & Rommel, 1999). Because lower frequency sounds travel further, dolphins tend to use lower frequencies when echolocating on objects that are at a distance. Lower frequency clicks, however, do not deliver as much detailed information about an object as higher frequency clicks. Thus, as the dolphin moves closer to an object, it can increase the frequency of its echolocation to learn more about the object. Dolphins have a waxy, lens-shaped structure in their forehead called the melon that focuses the clicks into a tight beam forward. When dolphins are examining an object or scanning their environment, their heads move rapidly from side to side as they direct the echolocation beam back and forth across the object or through the environment. Dolphins may be able to accurately echolocate on objects as far away as 100 yards. However, dolphin echolocation is useless in air. The clicks emitted by a dolphin strike objects in its underwater world and bounce back as echoes to be picked up through the dolphin's lower jaw From the returning echoes, a dolphin can tell the size, shape, distance from, speed, direction of travel, and density of the object. Thus, dolphins can tell the difference between materials of different densities, even if they look the same. Dolphins are particularly good at detecting air spaces within objects. Since most fish have a swim bladder filled with air to maintain the fish's equilibrium, dolphins can easily detect fish with their echolocation. Dolphins have an exquisite anti-jamming ability associated with their echolocation. Even in a large group of dolphins all echolocating at once, each dolphin seems to be able to pick out its own echolocation echoes and not collide with another (Au et al., 2000). Interestingly enough, scientists now speculate that a dolphin’s teeth may play a part in receiving incoming echolocation pulses. The teeth are perfectly spaced one tooth space apart from each other, and the teeth on one side of the jaw are aligned one half of a tooth space forward than the other side of the jaw. It is believed that this arrangement of the teeth acts as an array or antenna focusing the incoming sound and helping the dolphin pinpoint the exact location of an object (Goodson & Klinowska, 1990). Dolphins do not echolocate constantly, especially if they are in a familiar area or if the visibility is quite good. 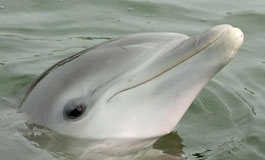 When not echolocating, dolphins rely on their extremely sensitive hearing for information about their environment, including sounds made by other dolphins. Often dolphins catch prey by listening for it rather than with echolocation. The sound emitted by a dolphin when echolocating may give away their presence. Dolphins can control the loudness of their echolocation clicks, adjusting this based on their surroundings and how far they want the clicks to travel. The concern that dolphins living in aquariums with concrete walls may be harmed by the sounds of their echolocation bouncing off the walls is completely unfounded (Au et al., 2000). The following video provides an animated view of dolphin echolocation. Burst pulse sounds are a general classification given to such sounds as barks, mews, chirps, and pops. Dolphins apparently make these sounds only under emotional duress, when they are angry, frightened, upset, or frustrated. These sounds can be directed towards humans, other dolphins, and inanimate objects. Researchers have thought for a number of years that dolphins could stun or kill fish and squid with sounds they produce, having observed fish in dolphin pools swimming one minute and lying on the bottom the next. At first, researchers thought that dolphins used echolocation as the stunning sound, since dolphins are capable of echolocating very loudly (see below). Testing revealed that dolphins trained to echolocate powerfully at fish and squid did not stun them, so researchers began looking elsewhere for the stunning sound. Recordings of bottlenose dolphins and orcas in the wild have led researchers to now look at loud, low frequency sounds, or even burst pulse sounds, as the source of the dolphin's ability to stun prey (Reynolds & Rommel, 1999). In recent years, noise pollution has become a serious issue affecting marine mammals. Anthropogenic sounds (man-made noise) can inhibit a cetacean’s ability to navigate, find food, rest, locate another for protection or mating, among a number of other essential activities. Man-made noise arises from a variety of sources such as oil drilling, sonar testing, explosives, and seismic surveys. However the majority of man-made sound in the ocean comes from ships. According to research conducted by scientists at Scripps Institution of Oceanography, noise levels in 2003-2004 were 10 to 12 decibels higher than in 1964-1968. The main cause of this is increased global shipping trade. According to John Hildebrand of Scripps, the noise is more powerful by a factor of 10. This noise increase is due to more and noisier ships. Recently there has been much discussion and concern over the Navy’s testing of sonar. There is mounting evidence to suggest that sonar has indeed caused adverse affects on marine mammals. Sound deployed with such intensity may even be severe enough to cause stranding and death. The Navy itself has voiced concern about the affects of sonar and has begun funding research to study the affects of man-made noise on marine mammals. 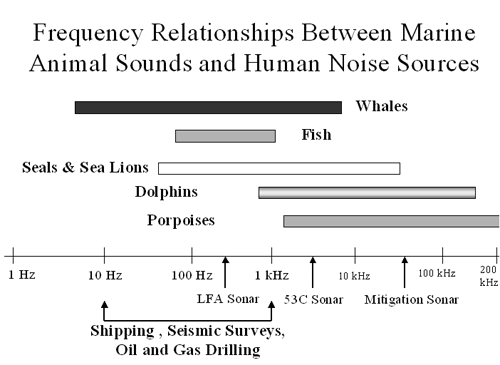 The diagram below illustrates the frequency range of some man-made sounds to the frequency range of sounds made by different marine mammals. From this you can see where they overlap and interfere. Currently there have not been enough scientific studies conducted to understand the impact of any type of man-made sound on marine mammals to determine what is detrimental to their survival. Continued scientific study is desperately needed to investigate this issue in order to maintain the safety and protection of marine mammals and their environment. Until we have a better understanding of the affects of man-made sound on the marine environment and its inhabitants, noise pollution, regardless of the source should be limited and avoided in areas that marine mammals frequent. Au, W. 1993. The Sonar of Dolphins. New York: Springer-Verlag. hypothesis for the Atlantic bottlenose dolphin, Tursiops truncatus. Pages 199-234 in Leatherwood, S. and R. R. Reeves, (eds. )The Bottlenose Dolphin. 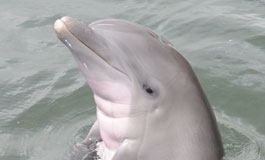 San Diego, California: Academic Press, Inc.
Goodson AD, Klinowski M (1990) A proposed ceholocation receptor for the bottlenose dolphin, Tursiops truncatus: modeling the receive directivity from tooth and lower jaw geometry. In: Thomas JA, Kastelein RA (eds) Sensory Abilities of Cetaceans: Laboratory and Field Evidence, New York: Plenum Press, pp 255-268. National Research Council of the National Academies, 2005, Marine Mammal Populations and Ocean Noise, The National Academies Press, Washington, D.C.
Norris KS (1968) The evolution of acoustics mechanisms in odontocete cetaceans. In: Drake ET (ed) Evolution and Enviornment. New Haven: Yale University Press, pp. 297-324. Ridgway SH, Carder DA, Green RF, Gaunt AS, Gaunt SLL, Evans WE (1980) Electromygraphic and pressure events in the nasolaryngeal system of dolphins during sound production. In: Bussnel RG, Fish JF (eds) Animal Sonar Systems. New Yourk: Plenum, pp 239-249. 319-344 in Pryor, K. and K. Norris (eds.). Dolphin Societies: Discoveries and Puzzles. Berkeley and Los Angeles, California: University of California Press. Tyack, P. 1999. Communication and cognition. Pages 287-323 in Reynolds, III, J. E. and S. A.
Rommel (eds.). Biology of Marine Mammals. Washington D. C.: Smithsonian Institution Press. Tyack, P. 2000. Functional aspects of cetacean communication. Pages 270-307 in Mann, J., R.
C. Conner, P. L. Tyack, and H. Whitehead (eds.). Cetacean Societies: Field Studies of Dolphins and Whales. Chicago, Illinois: The University of Chicago Press. III, J. E. and S. A. Rommel (eds.). Biology of Marine Mammals. Washington D. C.: Smithsonian Institution Press.